The 7th Annual Pitch for the Cure raises money for the Susan G. Komen for the Cure Foundation. Check in for the event is at 5:30 p.m. with the walk set to begin at 6:00 p.m. The one mile, flat walk circles around Avista Stadium before finishing on the field, where the participants will be recognized in a special pre-game ceremony. The game against Salem-Keizer begins at 6:30 p.m. as Spokane players will be wearing special pink jerseys that will be auctioned off to support the cause. The cost for the walk is $25 for adults and $15 for kids 12 and under. Participants receive a technical t-shirt, a donation in their name to the Eastern WA affiliate of the Susan G. Komen Foundation, and a ticket to the Spokane Indians baseball game that night against Salem-Keizer. Deadline for registration is Wednesday, August 8th, with a late registration fee of $5. Packet pick-up is scheduled for Friday, August 24th from 10:00 a.m. to 2:00 p.m. at Avista Stadium and the day of the walk starting at 5:00 p.m. at Avista Stadium. In addition to Mike’s Hard Pink Lemonade, supporting sponsors for this year’s Pitch for the Cure include Itron, Pepsi, and Ross Printing. Media sponsors include The Big 99.9 Coyote Country and KXLY 920 AM. Registration is now open at active.com. 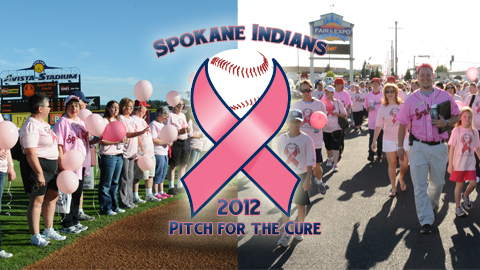 For more information about the event, call the Indians at (509) 535-2992 or visit Pitch-For-The-Cure.com. The Spokane Indians return to Avista Stadium on Friday, July 27th for Ian Kinsler Bobblehead Giveaway presented by Alaska Airlines, KREM-2 TV, 103.1 KCDA, and Out There Monthly. On this highly-anticipated night, the first 1,000 fans and all Banner Bank Diamond Club Members will receive a limited edition bobblehead of former Spokane Indian and current Texas Rangers All-Star Ian Kinsler. Tickets for all Spokane Indians home games are available for purchase at the Indians Ticket Office or at spokaneindians.com. Reserve your seats today by calling (509) 343-OTTO (6886) or TicketsWest at 1-800-325-SEAT. This article originally appeared on the official website of the Spokane Indians. Click here to view the original story. Several members of the Princeton Rays baseball team will be appearing at four Grant’s Supermarket locations next week in the role of bagging groceries for customers while also collecting canned food good items for those in need. Several team members will be appearing on Thursday, July 26 from 10:30am-12:30pm at two Princeton-area Grant’s Supermarkets: the Main Street location in Princeton and at the Athens Crossroads. They will be bagging groceries for, and visiting with, customers. People shopping during these hours are encouraged to buy an extra non-perishable canned food item and leave it at the checkout counter with the players, who will in turn forward the items to the Tender Mercies Food Pantry of Princeton. This procedure will then be repeated on Friday, July 27 from 10:30am-12:30pm at two other Grant’s locations: Green Valley and Glenwood. “It is a privilege for us to be asked to partner in such a worthy endeavor as this with Grant’s. We hope a lot of folks will come out and also purchase at least one extra canned good item to help out Tender Mercies,” said General Manager Jim Holland in making the announcement on July 19, and who also added that the team members bagging groceries may switch on the hour to allow even more players to be involved. Persons needing more information are asked to contact the Princeton Rays either by e-mail at princetonrays@frontier.com or by telephoning the team’s office at Hunnicutt Field at (304) 487-2000. To get more immediate and breaking information year-round on Princeton Rays Professional Baseball as it occurs, do not forget that the P-Rays are now on Facebook. Be sure to check out and “like” our Facebook section on our website at www.princetonrays.net. Don’t miss your opportunity to sign up for this free service! ANOTHER FREE OPPORTUNITY for you to keep up with your P-Rays is to follow the team on “Twitter” at @princetonrays or by accessing www.twitter.com/princetonrays. This article originally appeared on the official website of the Princeton Rays. Click here to view the original story. Last Saturday, July 14th the Pawtucket Red Sox and Novo Nordisk teamed up to present Changing Diabetes Night at McCoy Stadium when the PawSox took on the Buffalo Bisons. Before a bustling crowd of 7,449 Novo Nordisk continued their goal of educating people on the importance of early detection, treatment and prevention of the diabetes disease that afflicts tens of millions of Americans. To kick things off the reigning Mrs. Rhode Island of the Mrs. America franchise welcomed the crowd with a message from the title sponsor and threw out a ceremonial first pitch. Proudly displaying her ‘blue bull’ t-shirt and tiara, she then took up residence in the Cox Fan Center where she spent some time signing autographs and taking pictures with eager PawSox fans. Novo Nordisk and the American Diabetes Association each set up tables in the Main Gate Entry Tower to greet fans as they entered the stadium and distribute literature. Ever supportive of non profit organizations, Novo Nordisk agreed before a pitch was even thrown to donate $500 per home run hit by either team that day to the Pawtucket Red Sox Charitable Trust Foundation with the understanding that the half of the final tally would then be given to the Massachusetts American Diabetes Association. If a batter were to hit a HR off of the ‘Changing Diabetes’ sign in left/center field the organization would then donate $5,000 to the PawSox Foundation. While there were two round-trippers hit during the contest, by Buffalo’s Zach Lutz and Pawtucket’s JC Linares, Novo Nordisk doubled their obligated contribution making the total contribution $2,000. Representatives from both organizations will take part in a pre-game check presentation on August 31st. There are two main types of diabetes, Type 1 and Type 2. Those who suffer from Type 1 are born with a genetic pre-disposition to the disease, while those with Type 2 develop it later in life and suffer from insulin resistance and relative insulin deficiency. Both require control through diet, exercise and consistent monitoring and adjusting of blood sugar levels. If you are living with diabetes or know someone who is, visit Cornerstones4CareTM for tools to help your care plan work harder for you, ongoing updates about diabetes care, and tips and inspiration to keep you moving forward. CHARLESTON, S.C. – The Charleston RiverDogs, the South Atlantic League affiliate of the New York Yankees, will host their 13th Annual “Kindness Beats Blindness” RP Auction on July 28 at Joseph P. Riley, Jr. Park. All the proceeds for the event will go to the Medical University of South Carolina’s Storm Eye Institute, which is dedicated to researching ways to try to prevent the loss of sight. 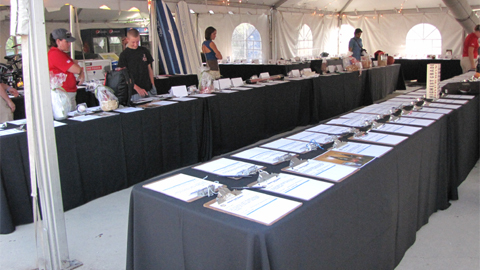 The silent auction will begin when the gates open at 6 pm and will conclude in the sixth inning. Those in attendance will have ample opportunity to “Be Your Own Fan” while taking home once-in-a-lifetime items, and lending a helping hand to a worthy cause in the process. There will be a wide range of specialty gifts available at the auction, including a Walt Disney Dream Vacation, a New York package that will contain a hotel room, and tickets to a Yankees game and a Broadway show, as well as a Cooperstown package with passes to the Baseball Hall of Fame. These are just a few of many specialty gifts and services that will be available. There will also be various sports memorabilia, with items autographed by Hall of Fame pitcher Phil Niekro, former Atlanta Braves All-Star John Smoltz, current Braves star Chipper Jones, New York Yankees pitcher Andy Pettitte and many more. All fans that enter the ballpark are eligible to bid on the various goods and services. More than $400,000 has been donated to the Storm Eye Institute to help fight Retinitis Pigmentosa, a disease that causes blindness and has affected Rebecca Veeck, the daughter of RiverDogs President Mike Veeck. Additionally, the first 1,000 fans through the gates on Saturday, July 28, will receive a free Jorts Patch, courtesy of WTAT Fox 24. For additional information about the “Kindness Beats Blindness” RP Auction or if you are interested in a donation, please call Melissa Azevedo at (843) 577-DOGS (3647) or visit www.riverdogs.com. This article originally appeared on the official website of the Charleston RiverDogs. Click here to view the original story. 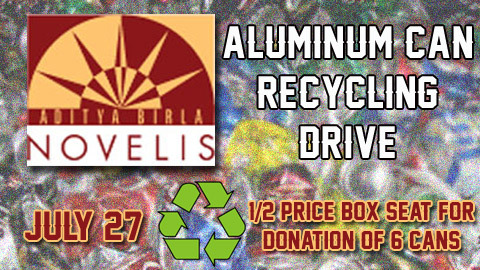 The Mahoning Valley Scrappers along with Novelis announce an Aluminum Can Recycling Drive at Eastwood Field on Friday, July 27. The Scrappers play host to the Staten Island Yankees and anyone that brings a donation of at least six aluminum cans will receive a box seat at half price. Gates will open for at 6:00 pm and first pitch is scheduled for 7:05 pm. Novelis is the world leader in aluminum rolling, producing nearly 20 percent of the world’s flat-rolled aluminum products. In addition to the Aluminum Can Recycling Drive, Novelis is proud to bring post-game fireworks. The fireworks extravaganza will take place following the game is free of charge with admission to the game. Friday is also Faith night at Eastwood Field sponsored by the Nicholson Center. Throughout the night there will be faith-based entertainment. Friday is the third game of a six game homestand the Scrappers have from July 25-30. Highlighting the homestand is an appearance by soap star “Brady Black” and Baseball Brawl III. Brady Black’s appearance is brought to you by Mayfair Laundromats and 21 WFMJ and Baseball Brawl II is courtesy of Northeast Martial Arts & Fitness, Corona Extra, Y-103, Labatt Blue and MCW Championship Wrestling. For more information contact the Scrappers Front Office at (330)505-0000 or click here for tickets. This article originally appeared on the official website of the Mahoning Valley Scrappers. Click here to view the original story. BURLINGTON, VT — On Wednesday, July 4, Travelers, a leading provider of auto, home and business insurance, and the 2012 Vermont Lake Monsters hosted “Travelers Night at the Ballpark.” Mayor Miro Weinberger joined fans to “Chip for Charity” at the Travelers Chipping Challenge and Fan Zone, and later threw out the first pitch, helping Travelers raise $5,000 for the Turning Point Center of Chittenden County. Travelers and Mayor Weinberger presented the check on field following the first pitch at Centennial Field. 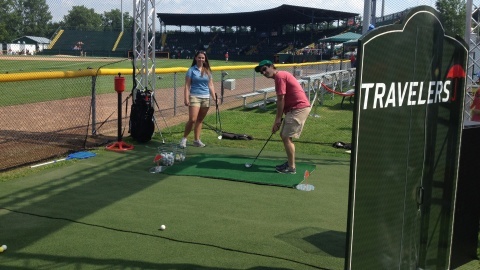 The Travelers Chipping Challenge is an interactive experience that includes taking a golf shot at a floating green in the shape of the iconic Travelers red umbrella for the chance to win some great prizes. Additional fan activities at the Travelers Night at the Ballpark included the Travelers Putting Challenge, where fans who made two out of three putts received a prize, as well as the Travelers photo experience, where fans posed for their personalized cover of the Lake Monsters game program.Be sure to sign up for the ultimate Travelers VIP experience out at Centennial Field at the fans relations table. The Travelers VIP Fan Experience includes 25 tickets for a lucky winner and his/her friends, on-field access to meet the Vermont Lake Monsters field manager and current players, and a signed Lake Monsters Jersey. The contest runs through Tuesday, August 21. This article originally appeared on the official website of the Vermont Lake Monsters. Click here to view the original story. Spokane, WA – For over 10 years the Spokane Indians and Premera Blue Cross have teamed up for the Premera Care-A-Van, a program where children in local hospitals receive a visit from OTTO the Mascot and current Indians players. The first of three Care-A-Van visits is today at Sacred Heart Children’s Hospital. In addition to the visit from players and mascots, the children will receive a Care-A-Van Backpack full of Spokane Indians items courtesy of Premera Blue Cross. The Indians also provide tickets for former patients who have now recovered and are living in the Spokane area. The Indians and Premera Blue Cross have three Care-A-Vans planned for this year, including today at Sacred Heart, August 14th at Deaconess Medical Center, and August 21st at Shriners Hospital for Children. All media are invited to attend. For more information about the Premera Care-A-Van program, please call (509) 535-2922. Tonight’s game is the second game of a three game series against the Tri-City Dust Devils and is Baseball Hat Giveaway presented by Pepsi, Arby’s, and The Inlander. The first 1,000 fans and all Banner Bank Diamond Club Members will receive a FREE limited edition Spokane Indians Baseball Hat. Also tonight, kids are encouraged to stick around after the game for the Supercuts Post-Game Circle the Bases promotion. The game starts at 6:30 p.m. with gates opening at 5:30 p.m. Tickets for all Spokane Indians home games are available for purchase at the Indians Ticket Office or at spokaneindians.com. Reserve your seats today by calling (509) 343-OTTO (6886) or TicketsWest at 1-800-325-SEAT. The Albuquerque Isotopes hosted 112 participants in their first of two annual Youth Baseball Clinics on Saturday morning at Isotopes Park. Follow an opening reception from the Isotopes team, Manager Lorenzo Bundy, hitting coach John Valentin, pitching coach Glenn Dishman, strength and conditioning coach Brandon McDaniel; pitchers Stephen Fife, Blake Johnson, Derrick Loop, Scott Rice, Will Savage, Cole St. Clair; infielders Joe Becker and Tyler Henson, and outfielders Jerry Sands and Brian Cavazos-Galvez offered one-on-one instructions to kids ages 5-15 on a variety of baseball fundamentals. Clinic participants were divided into groups and rotated through a series of stations including; throwing, bullpen, outfield, conditioning, infield, and hitting. Each station ran nearly 30 minutes to provide ample opportunity for each participant to fully take part in all of the baseball action. After each group had a chance to try each station, those in attendance were served lunch courtesy of McDonald’s in the picnic pavilion. ‘Topes players and coaches concluded the clinic by spending time with the participants and signing autographs. 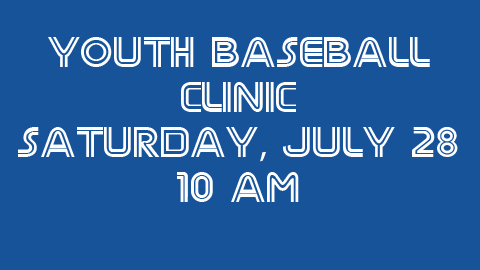 All kids ages 6-16 are invited to come to Bowen Field with the Bluefield Blue Jays players and staff on Saturday, July 28th from 10 a.m. to 12 p.m. for a free baseball clinic. Signing up for the event takes place at 9:30 a.m. the day of the clinic for no cost. After learning about the game from the pros, all participants will receive a hot dog and a drink after the clinic. This article originally appeared on the official website of the Bluefield Blue Jays. Click here to view the original story. NORWICH- The Connecticut Tigers will be partnering with “Bikes For Kids” in hosting a bike drive prior to and during the game on Saturday, July 21st between Tigers and the Lowell Spinners, the New York-Penn League affiliate of the Boston Red Sox at 7:05 PM. The gates will open at 6:00 p.m. on Saturday, July 21. Bikes For Kids is a Connecticut-based non-profit organization that provides bicycles and equipment to children and families in need. The organization focuses its donations locally in Connecticut, but has also given bicycles and equipment to Haiti, Africa and various causes from around the United States. 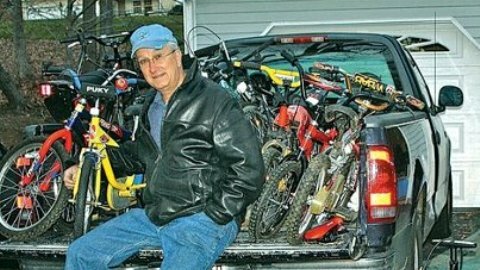 Bikes For Kids was founded by the late Chuck Graeb in 1989. Graeb founded the organization on the idea that “every child should be able to experience the enjoyment of owning and riding their own bicycle.” Upon Graeb’s passing in 2009, current president David Fowler assumed leadership of the organization. “We put people on wheels that would either be walking or not really going anywhere at all,” said Fowler. Representatives from Bikes For Kids will have a table set up on the concourse behind the press box during the game collecting new to slightly-used bikes, new helmets and other new or slightly-used equipment. The organization reached 13,000 bicycles donated in November of 2011 and has already collected 700 bikes in the 2012 calendar year. With the assistance of the Tigers and the bike drive at Dodd Stadium, Bikes For Kids hopes to surpass a total of 14,000 bicycles donated by the end of the month. The Connecticut Tigers are the Class-A affiliate of the Detroit Tigers and play in the New York-Penn League. The Tigers saw a 23% increase in attendance in 2011 (the 4th highest in Minor League Baseball), and are entering their 3rd season at Dodd Stadium. The Box Office is open 9 a.m.-5 p.m. Monday through Friday. In addition, tickets can be purchased over the phone at (860) 887-7962. For more information go online to cttigers.com. This article originally appeared on the official website of the Connecticut Tigers. Click here to view the original story. 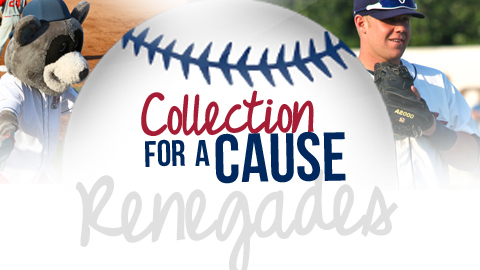 The Hudson Valley Renegades are teaming up with local non-profits for “Collection for a Cause” days throughout the 2012 season. On the selected days, the Renegades are asking fans to donate the selected items in exchange for $1 General Admission Tickets. Monday, July 30: Elant – organization is asking for the following items; Word Search, Crosswords, Puzzle Books, Large Print Hardcover Books Nail Polish, White Tube Socks, Playing Cards, CD’s and DVD’s (new), $5 Gift Cards for Walmart or Target..
Thursday, August 9: Gifts From the Heart For Downs: – organization is asking for unused/gently used sneakers that are used to support wishes for those with Downs. Wednesday, August 22: ARCS – organization in need of Toiletries/Personal Hygiene Products. Tuesday, August 28: Ronald McDonald House Charities -The Ronald McDonald House will be accepting gift cards from food, office supplies, home improvement stores, etc. to help their families in need. Items may be dropped off at the Hudson Valley Renegades Ticket Office in exchange for a $1 General Admission Tickets for the “Collection For A Cause” selected date. For questions, contact the Renegades Ticket Office at 845-838-0094. This article originally appeared on the official website of the Hudson Valley Renegades. Click here to view the original story. Syracuse, NY- The Syracuse Chiefs, the Triple-A affiliate of the Washington Nationals, are proud to announce the club will host its second annual Breast Cancer Awareness Night at Alliance Bank Stadium on Friday, July 20, when the Chiefs host the Norfolk Tides. All money raised from the event will be donated to the Carol M. Baldwin Breast Cancer Research Fund of Central New York, which gives $250,000 worth of grants to SUNY Upstate Medical every year for breast cancer research. All fans are invited to attend a “Pink Cocktail Party” in Alliance Bank Stadium’s Hank Sauer Room with Carol M. Baldwin and her son, actor Billy Baldwin. Admission to the party is $50 per person and includes dinner, a game ticket, and parking pass. The Baldwin mother-son duo will throw out the game’s ceremonial first pitch as well. In keeping with the theme of Breast Cancer Awareness Night, Chiefs players and coaches will don pink and black jerseys and hats for the 7:00pm game with the Tides. Some players will also wear pink batting gloves and use pink bats and mitts. Additionally, Alliance Bank Stadium’s Carol M. Baldwin Breast Cancer Awareness merchandise cart will be set up, as it is for every Chiefs home game, to sell Pink bracelets, t-shirts, flip-flops, lanyards, and rings. “The most important part of the fund is that 100% of the money that we raise locally stays locally and goes to research so that we can find a cure,” said Laurence Segal, a Chiefs employee and Carol M. Baldwin Fund volunteer. Last year’s Breast Cancer Awareness Night at Alliance Bank Stadium raised $6,000 for breast cancer research. In total, the Carol M. Baldwin Breast Cancer Research Fund of CNY has fundraised more than $7 million for research. For more information on Breast Cancer Awareness Night, contact Laurence Segal with the Chiefs at 315-474-7833. Tickets to the “Pink Cocktail Party” and all Syracuse Chiefs home games, can be purchased in person at the Chiefs ticket office at Alliance Bank Stadium, by calling 315-474-7833, or online at SyracuseChiefs.com. This article originally appeared on the official website of the Syracuse Chiefs. Click here to view the original story. The Bradenton Marauders have launched the Marauders Reading Scores Program to get Manatee County children reading this summer. Manatee County elementary school students that read four books and complete a Reading Scores card provided by the Marauders can redeem the card for a free ticket to a Marauders game and a coupon for one free 10-inch small cheese pizza from Papa John’s. The Marauders Reading Scores Program is presented by Papa John’s Pizza, the Bradenton Herald, the Manatee Education Foundation, and the School District of Manatee County. Reading Scores cards are available at McKechnie Field, the front desk at Pirate City, and Manatee County libraries. Each time a child reads a book, he or she can color in one base on their Marauders Reading Scores card, write the book’s title in the assigned space under the base, and have a parent or guardian sign the form. After reading their fourth book of the summer, home plate can be colored in and the card is ready to be exchanged. Turn the card in at the McKechnie Field box office for a free Marauders ticket to any non-Wednesday game and a coupon for a free small chesse pizza from Papa John’s. The Marauders Reading Scores program is part of the Bradenton Marauders’ commitment to making a positive impact in their local community. Helping children learn not only to read, but to enjoy reading, is important to improving educational success. Marty the Marauder and several Marauders players visited the Manatee County Central Library in Bradenton Monday to promote childhood reading. Fellow pitcher Kenn Kasparek echoed Townsend’s sentiments. For more information about the Marauders Reading Scores Program, call 941-747-3031 or email MaraudersInfo@Pirates.com. This article originally appeared on the official website of the Bradenton Marauders. Click here to view the original story. COLCHESTER, VT – At the Burnham Memorial Library in Colchester on June 28th, Vermont Lake Monster pitchers’ Kurt Wunderlich and Tucker Healy read to approximately 50 kids, promoting reading among children with the Lake Monsters ‘Hit the Books’ program sponsored by Price Chopper. The ‘Hit the Books’ program, which is open to kids in kindergarten through eighth grade, calls for kids to read four books and send in an entry by August 1st. In return, the child will receive a ticket for a Lake Monsters baseball game this summer for their efforts. There is also an on-field recognition ceremony for all the kids who participated in the program on the September 1st game against the Tri-City ValleyCats. For more information on the ‘Hit the Books’ program call the Lake Monsters at 802-655-4200. Forms may be mailed to the Lake Monsters at 1 King Street Ferry Dock, Burlington, Vermont 05401.